A fair result in the end.........a poor game played out by 2 poor looking sides in a match devoid of any quality at all apart from the 2 goals both scored 5 minutes before the end of each half. For our goal Zebroski picked up the ball in his own half.......beat 2 men for pace, got to the byline and crossed low to Rendell who swivelled well, as the ball was a shade behind him before placing it neatly in the corner. Their's was definitely coming for a long while and was due to a quite brilliant bit of skill by Miller.........who 10 minutes before had blazed over terribly from the penalty spot. Miller managed to take the ball at pace across our area beating 3 or 4 men before sublimely back-heeling it into the path of Donaldson......who couldn't miss from point blank range. We dropped too deep in the second half and invited them onto us.......a match we were winning comfortably after an hour against a poor Crewe side, who were ready to be beaten by 2 or 3 goals. The problem we had was that the ball was no longer sticking up front in the 2nd half....when that happens you know your in trouble, we resorted to giving the ball back to them time after time.......Benyon had ran himself into the ground and was rightly subbed.....Rendell needed to be subbed too......having no striker on the bench cost us today. A quick summary of performances........in goal Bevan had a good game and is looking sharp again. At the back we were good, the full backs defended well....Robbo is looking unbelievably like a right back these days and LRT got better as the game went on and gave his winger nothing............perhaps the plainmoor crowd will finally give this lad a chance now and get behind him. Elllis typically lunged in to give away a soft pen....otherwise he was fine as was Branston as usual. In Midfield, which we're generally bypassing these days, Wroe had one of his poorer games, when little came off for him. Mansell.........did his best as usual. Carlisle needs a few games now and Zeb was far better than he has been at left midfield for a while. Up front Rendell scored a fine goal and also had a good header from a corner cleared off the line and then that brings me to Benyon. One can only admire his terrific work rate and committment, he really does try his best and was probably a deserved MOM only for the fact that we produced such little quality today, so Elliott got it for running his socks off. In the cold light of day though.........he had absolutely no shots on goal again today........and is no real threat. We need a new striker who is one......if we're ever going to threaten the top half of this league next season, providing of course, we stay up. I expect i'll get shouted down for being anti Benyon........I cringed at the standing ovation he got when he was subbed, you need to offer more than just wholehearted committment when you play in his role. Your in small minority with that opinion of Elliots performance and of the game generally JM. It was a well contested good quality lower league match and there was plenty of quality especially from the Alex midfield. I also think your are wrong to say Benners had no efforts on goal he had shots blocked in the area by defenders in the first half. Why did you cringe when awarded MOM he was one of ours giving his all and there was no other choice as far as I'm concerned. Who would have been your choice, Nicky Wroe? No you have made up your mind just as others have with regard to the manager and no matter what he does you will always slag him off. If you read my post properly pete, you'll see i quite clearly said that he deserved mom (for what these sponsors awards are worth). I also said Wroe had a poor game.......so not sure what point you are trying to make? I like benyon as a player..........i like any player that works his socks off for our club, i would love him to be our main man up front........that lack of a yard more pace is killing his chances.....in my opinion, and means most weeks he isn't a big enough goal threat unless of course the centre halves are really slow, such as today. 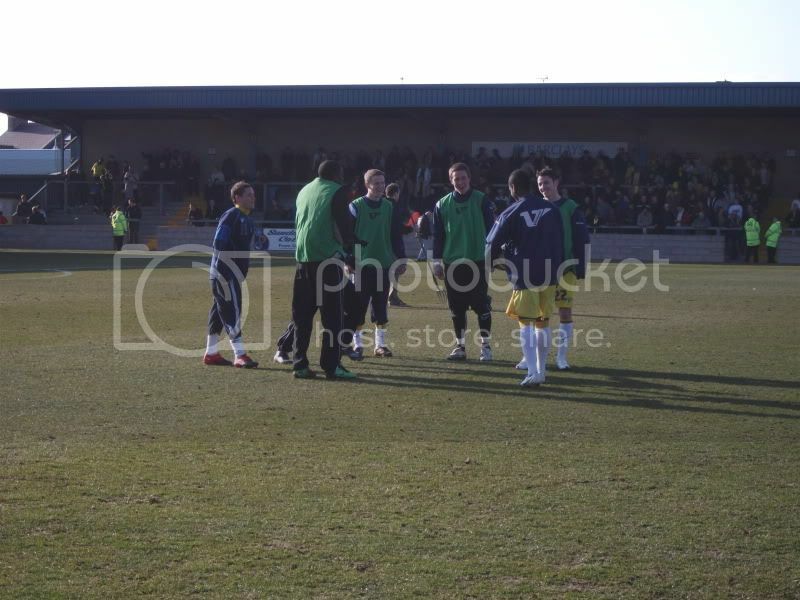 I cringed at the standing ovation, which i felt was a bit over the top.......Elliott did half his job very well today, ran the channels, chased everything and tried to be a nuisance............to be fair, if you or I were 20 years younger and given the chance to play up front for TUFC...we would run our arses into the ground aswell . The facts though are that Elliott, for all his undoubted effort did not create one chance, have a shot on or off target or or obviously score..........so in my book the plaudits he's receiving are wee bit on the generous side. We all have opinions and my, maybe, too simplistic view is that i like defenders to defend, wingers to cross and strikers to look like a goal threat. ps If you thought that was a quality game......you have my sympathy. Elliot Benyon and Guy Branston were far and away our best performers today. Nicky Wroe sadly had a game to forget - absolutely nothing went right for him. I won't post a lot as I think Andy and Swangull have covered most points and I completely agree with Andy's ratings. It was my first home game since Bradford and my first game since the Crewe game at Gresty Road. It was my first sighting of LRT and I thought he had a good game. With a bit more development he's tall enough to become a decent entre half. Our back four now looks it's a bit more no nonsense than before. Benyon was excellent today, especially in the first half. Easily the best performance in a TUFC shirt. A standing ovation was a little OTT but at least it's a positive show of support who still plays for us. But it's the kind of performance that might get him more of a starting role in the first team and more performances like this will certainly hope. He obviously likes playing with Rendell though. It's good to have him back. Special mention must go to the loudness of the woman on the microphone during the half time. She's certainly saved me the need to have my ears syringed. Extra special mention goes to Guy Branston. The Crewe lad who missed the penalty and was still a bit upset threw the ball down in frustration after not winning a throw in. The referee looked like he was going to book him and our Guy went over and asked the ref not to book him. A nice touch on Guy's part I thought and a far cry away from the usual cheating and getting opposition players yellow carded for nothing. Can I just say thanks for the reports all of you--much appreciated. Think the general opinion is we would have all settled for a point before the game and this continues our great unbeaten run. Delighted to also hear that Guy continues his form ---he really has surprised a few "experts". Poor old Nicky Wroe continues to stumble through the season---I am sure he is due a good game soon. From where I was sat a draw was probably a fair result in a game with more huff and puff than quality. Neither side enjoyed enough meaningful possession or had the ability to take the game by the scruff of the neck and force the issue. We were the better side in the first half without ever dominating and that was the pattern of the game until the last quarter. With 15 minutes remaining and Crewe pressing for an equalizer they were awarded a stone wall penalty. Even after they missed it the momentum stayed with them and when they eventually got the goal 5 minutes later it was a case of here we go again. But did we cave in? No we did not and came away with a point. A point that I would have taken at dinner time. A point that I would have taken at dinner time. Do you mean lunchtime, as dinner time would have been after the game? Not if he was pondering what score he would take whilst eating dinner the night before the match? We ended the game with two players on the pitch (Rendell and Carlisle) who have not played hardly any football for the past six weeks or so. They both played well but quite clearly their lack of match practice showed at the end. A big mistake by the manager in not bringing on two fresh players with ten minutes to go. A key factor was also having no striking option on the bench and that needs to be addressed and quickly. We had two wingers on the pitch,four on the bench and another one in Macklin who didn't make the squad and no striker in reserve. If ever that tells a story then that does and is indicative of the baffling transfer policy that has blighted this season. miac, with Barnes going back to his own club we are now one striker short at least and Bucks may well have to try and bring one in for our remaining games. Both Rendell and Carlisle were always likely to run out of steam toward the end of the game and I will agree it might have been better to leave Benyon on, take of both Rendell and Carlisle and send on Muzzy and Jake Thomson for the last 20 minutes. You can go on all you want about what you choose to call the baffling transfer policy I would agree its not been perfect but its in the past for now and these are the players we do have and the ones who have to win enough points to keep us up. I wanted to have a close look at our players today and more so those who are only making the bench and not getting any real match play. You can learn so much about the team spirit and how happy players are and today I saw they were all very close, all happy and it points to us having a happy dressing room and that is important for our remaining games. At half time our subs enjoyed a little game with the ball and it was so pleasing to see then enjoying it so much and they were all laughing and chatting away. When the first team came out Thomson went and had a word with Benyon and also it looked to me he was congratulating Rendell for his goal. I took some pictures of the subs at halftime and only because it was good to see then happy and not sulking around and I'm sure if and when they are needed, they will be in the right frame of mind to come on and do the required job for us. Whether the subs were happy or not has not really any relevance at all to todays result. What is the point of having four wingers on the bench - indeed what is the point of signing Macklin who cannot even make the squad. Yes it was always likely that Rendell/Carlisle would run out of steam. In which case why did the manager substitute Benyon who is fully fit and was running their centre halves ragged. No point at all really but due to what every reasons and where ever the blame may lie, we do find ourselves now with out the cover we should have in a few key positions. As I said we are here now and these are the players we have got and it is not going to change until this season is over.It really is a case of making the best of what we have got, making sure we stay up and learn the lessons that do need to be learned from this season and make sure we do things in a much better way next season. As fans all we must do is support the players who are picked and keep our trust in the manager to keep getting points on the board to keep us up, that is the only thing at this time that is really important. Baffling transfer policy? Please explain fully. Then we can debate it. It would be wrong of me to deride it before I fully understood where you're coming from. "Baffling transfer policy" or no, Macklin "couldn't even make the bench" yesterday for the same reason as Poke...................he isn't fit; same as Nicholson and Camara (too slow) and Nicho's also only still here and an option to the manager because he opted to sit tight and see out his contract in contrast to Greavsie and Sills who have moved to other clubs where they still cannot hold down a regular staring place for whatever reason ~ too old, too slow, unfit, it matters not they are the same limited option to their new managers as they were to Paul Buckle this season. Benyon being subbed? Again it matters not why that was, it might be that he was plain knackered and not holding the ball up, feeling a hamstring and we cannot afford to lose him or he just likes to be able to watch Sponge Bob Square Pants on the telly at five and it was getting late. It was just so predictable that DtG and Miac would be leading their usual attempted Saturday pilgimage to the manager's back. In Dtg's case it has always been like this with Bucks, and in Miac's it has been with any manager we have had since forum's began. Their response is just as predictable as the farmyard noises that immediately came over the air when Crewe got their equaliser yesterday. Noted and commented on by the BBC team, it seems nothing changes in the land of the unchangeable. Although Miac accentuates the negative as opposed to the positive, he was perfectly correct in stating that Rendell and Carlisle did as was to be expected, flag towards the end. For this reason, in my pre match post, I thought Benyon should have remained on the bench and to have come on later. However, in hindsight, it was Zebroski that went on the run and crossed for Rendell to score our goal. Rendell and Carlisle with ninety minutes on the pitch and a further week's training are unlikely to fade again. Benyon had a very good game - he didn't get any fox in the box chances that we know he is an accomplished finisher but put himself about and obtained possession in that final third of the field. I can think of four options that Buckle can do in respect of the striker shortage. 1) Keep Rendell and Benyon on for the full ninety minutes. They do work well together and the Zebroski / Carlisle wing combination does give us a very solid feel on the flanks. 2) Trust one of the other wingers to hold down a berth on the left wing allowing Zebroski to go up front with super sub Benyon to come on around the hour mark. 3) Convert one of the other squad members to come on as a sub striker - Thompson has played in the "hole" before. 4) Turn to the loan market once more.